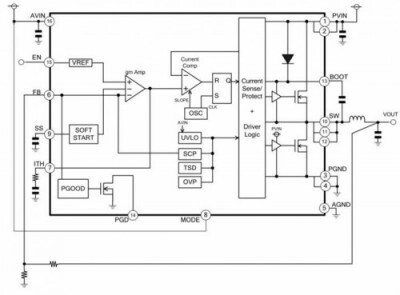 Reading the power supply IC datasheet correctly is a critical requirement in understanding the properties of and evaluation methods for the switching regulator. Newer, general power supply designs are highly dependent on the power supply IC; consequently, the design process heavily involves the design of the power supply IC. Thus, it is truism that the design task cannot be undertaken without reading the data sheet of the power supply IC. In this chapter, we explain the most salient aspects of a datasheet. Because there are a number of items to be covered, the chapter is divided into several subsections. In the present subsection, we address the cover page of the datasheets, the block diagram describing the functions of the IC, the absolute maximum rating, and the recommended operating conditions. The cover page of datasheets provides an overview of the power supply IC, its features, applications, and the various aspects that you need to know at first. Granted, manufacturers may differ in terms of the items to be covered and the order of presentation; that said, the cover page of datasheets provide the same basic items. Manufacturers vary, however, in the levels of detail that they provide and the items you need to know at first, depending on each manufacturer’s posture and idiosyncrasies. 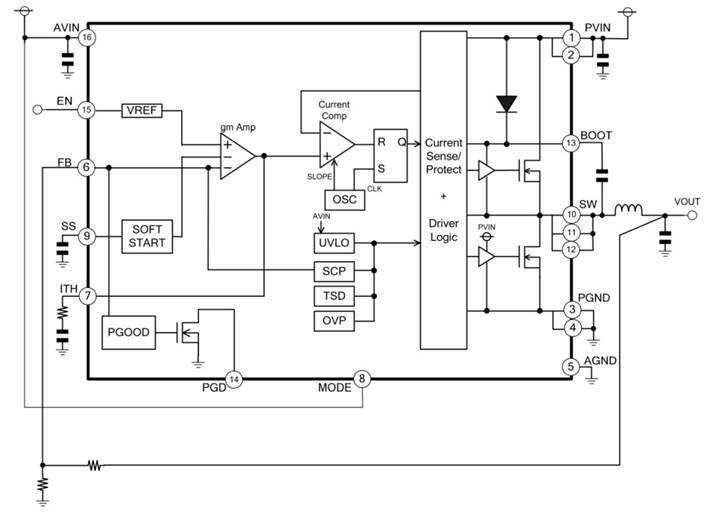 Consequently, the cover page of datasheets is an important item. As an example, first of all the “Title” gives you a rough idea of what specific power supply IC is being described. The “General Description” section provides a little more concrete description. The “Features”, in an outline form, describe the functions that are implemented and representative specifications for the IC. The example datasheet contains an item called “Key Specifications”, providing specifications that you need to verify as a power supply IC, presenting the values of minimum required basic items, short of describing the table of specification values. Package information is also necessary as an aid in visualizing the type of mounting space. This page also provides example applications and a typical application circuit, which can be used to determine whether or not the specific application for which the device being designed is taken into consideration. The required external components and the number of such components can be determined from the circuit; it is also possible to visualize the required components sizes. Finally, the last part of the information indicates that the device is a silicon monolithic IC and that it is not of a radiation-hardened design. Acquiring such information at the starting point can forestall many types of problems that can arise later on. The cover page for datasheets provides a quick overview. However, there are several items that need to be scrutinized. First of all, if the described properties are maxima, minima, or guaranteed values, or if typical values are not explicitly indicated, they must be verified by referring to the table of specification values. It is not uncommon that when an engineer started with the values provided on the cover page, the design ran into problems because it turned out that the values were only typical values, not guaranteed values. At the end of the day, you need to verify the properties by referring to the table of detailed specification values and by reading the section on functional description. In the case of an input voltage as an example, the Absolute Maximum Rating means that “it is a voltage that may be entered; however, whether or not the IC will operate correctly based on this input is another matter”. Also, since the Absolute Maximum Rating is only a rating, it is not associated with any tolerance or real values. In addition, although a rating implies that exceedance of the rating could result in destruction of the IC, it does not indicate a specific value at which the IC will be destroyed. In short, the absolute maximum rating represents a value that must not be exceeded under any circumstances. The Recommended Operating Range, while it is a “recommended” value, is held that it “must be complied with without fail”. This is a distinction which many readers may find difficult to comprehend. Although there may be different schools of thought regarding this point, given that datasheets supplied by manufacturers in the English-speaking regions of the world provide conditions and values with the same intent, grouped under “Recommended Operating Conditions”, we assume that such values are translated and used as “Recommended Operating Range (Conditions)”. Granted that the word “recommend” means just that, it also strongly means “advise, and refer to”. In this case, the word “recommend” means the latter, and to be faithful to the intent of the word it should have been translated as “normal operation guarantee range” or “operation-guaranteeing condition”. At any rate, in order to obtain the intended operation or performance, the IC must be used under the required conditions, as described in the conditions given below, for comparison with power supply voltage ratings. ・For power supply design, it is necessary to read and understand the datasheet of the power supply IC. ・IC manufacturers may differ in the order in which they list items and contents of those items. ・A quick reading of the cover page may provide you with an overview and the salient features of the IC. ・It is important to accurately understand what is intended by the Absolute Maximum Ratings and Recommended Operating Conditions.